Fred and Elizabeth Brenchley are the authors of Stoker's Submarine, about the AE2 which performed heroic actions in the Dardenelles in April 1915. THE navy is quietly confident it has located the remains of Australia's first submarine, AE1, which was lost off New Britain in September 1914. Three days of searching this week by the survey vessel HMAS Benalla located a large metallic object in waters near the Duke of York islands, not far from Rabaul, in Papua New Guinea. Minister assisting the Minister for Defence, Bruce Billson, said yesterday further investigations would be carried out later this year using a remotely operated vehicle to determine whether the find was, in fact, the missing AE1. "The object is approximately 25-30m long and 4m high and in order to protect the site from unauthorised activity, no further details will be released about itsposition," Mr Billson said yesterday. "I must stress that it is far too early to speculate about what the object detected by HMAS Benalla is and further investigation using a remotely operated vehicle with imaging capabilities would be necessary to make a positive identification." HMAS Benalla located the possible wreck of the AE1 using a towed side-scan sonar as well as hull-mounted sensors. The fate of the AE1 remains one of Australia's great naval mysteries, the submarine having been lost without trace on September 14, 1914. 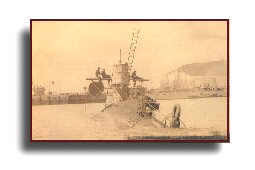 The 55m-long vessel carried a crew of 35 and was part of the first Australian military force to see action in World War I, in operations against German New Guinea. Crewed by British and Australian sailors, the AE1 was on patrol off the Gazelle peninsula, in company with the torpedo boat destroyer HMAS Parramatta, when it probably hit a submerged reef and sank with the loss of all hands.